ww2dbaseCommissioned in Feb 1943 with Lieutenant Commander Ralph Lynch, Jr. in command, USS Mingo had her shakedown cruise off Long Island, New York, United States. After three weeks of operations with the torpedo station at New London, Connecticut, United States, she set sail for the Pacific Ocean via the Panama Canal. She departed for her first war patrol in Jun 1943, during which she damaged and sank several Japanese ships and bombarded Sorol, Palau Islands. During her second war patrol in the Central Pacific, she damaged a Japanese cruiser with a torpedo, while on her fourth war patrol, she sank Japanese destoyer Tamanami. In the Philippine Islands and Borneo regions, she sank four small enemy vessels during her fifth war patrol, despite her primary mission being on lifeguard station. She patrolled the South China Sea, Gulf of Siam, and the general Philippine Islands and Borneo area until Apr 1945.
ww2dbaseUSS Mingo was decommissioned on 1 Jan 1947 and placed in reserve. In May 1955, she was recommissioned for the purpose of preparation to be transferred to the Japanese Navy under the Military Assistance Program. As submarine Kuroshio, she served with the Japanese Navy until 1966. In 1971, she was sold to Japan for scrapping, but in 1973 she was sunk as a target. 21 Mar 1942 Submarine Mingo was laid down. 30 Nov 1942 Submarine Mingo was launched, sponsored by Mrs. Henry L. Pence. 12 Feb 1943 USS Mingo was commissioned into service with Lieutenant Commander Ralph Lynch, Jr. in command. 1 Apr 1943 USS Mingo departed Long Island, New York, United States area for Newport, Rhode Island, United States. 16 May 1943 USS Mingo departed New London, Connecticut, United States for the Panama Canal. 25 Jun 1943 USS Mingo departed Pearl Harbor, US Territory of Hawaii for her first war patrol. 12 Jul 1943 USS Mingo damaged a Japanese freighter with torpedoes. 26 Jul 1943 USS Mingo fired four torpedoes at a Japanese tanker; all torpedoes missed. 6 Aug 1943 USS Mingo damaged a Japanese freighter, hitting her with one out of four torpedoes fired. 29 Sep 1943 USS Mingo departed Pearl Harbor, US Territory of Hawaii for her second war patrol. 16 Oct 1943 USS Mingo fired a spread of six torpedoes at a Japanese carrier, claiming two hits. 20 Nov 1943 USS Mingo arrived at Pearl Harbor, US Territory of Hawaii, ending her second war patrol. 22 Mar 1944 USS Mingo fired six torpedoes at a Japanese freighter; all missed. 9 May 1944 USS Mingo arrived at Brisbane, Australia, ending her third war patrol. 10 Jun 1944 USS Mingo arrived at Manus, Admiralty Islands for training. 18 Jun 1944 USS Mingo departed Manus, Admiralty Islands for her fourth war patrol. 7 Jul 1944 USS Mingo attacked a Japanese convoy off Luzon, Philippine Islands during the night, sinking destroyer Tamanami by hitting her with 3 of 8 torpedoes fired. 30 Jul 1944 USS Mingo arrived at Fremantle, Australia, ending her fourth war patrol. 27 Aug 1944 USS Mingo departed Fremantle, Australia for her fifth war patrol. 13 Sep 1944 USS Mingo fired three torpedoes at a Japanese ship; all missed. 2 Oct 1944 USS Mingo sank four small Japanese ships with her deck gun. 13 Oct 1944 USS Mingo arrivedat Fremantle, Australia, ending her fifth war patrol. 25 Nov 1944 USS Mingo sank a Japanese tanker in a night time torpedo attack, hitting her with three of six torpedoes fired. She also damaged an escorting vessel with one of four torpedoes fired. 25 Dec 1944 USS Mingo attacked a Japanese convoy between Singapore and Brunei, Borneo, damaging an escorting gunboat and sinking tanker Manila Maru. 29 Dec 1944 USS Mingo arrived at Fremantle, Australia, ending her sixth war patrol. 6 Feb 1945 USS Mingo departed Fremantle, Australia for her seventh war patrol. 10 Feb 1945 USS Mingo survived a typhoon, which caused some damage and caused 2 men to be lost. 14 Feb 1945 USS Mingo arrived at Fremantle, Australia for repairs, pausing her seventh war patrol. 19 Feb 1945 USS Mingo departed Fremantle, Australia, resuming her seventh war patrol. 10 Apr 1945 USS Mingo arrived in the Mariana Islands, ending her seventh war patrol. 20 May 1955 USS Mingo was recommissioned into service. 15 Aug 1955 USS Mingo was decommissioned from US Navy service and transferred to the Japanese Navy as submarine Kuroshio. 31 Mar 1966 Japanese submarine Kuroshio was decommissioned from service and returned to the United States. 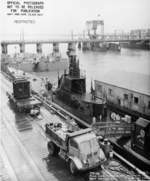 20 Feb 1971 Submarine Mingo was struck from the US Naval Register and was sold to Japan for scrapping. I just love to read these old WW-11 submarine patrol reports....!!!! Thank you for keeping these stories alive !!! !